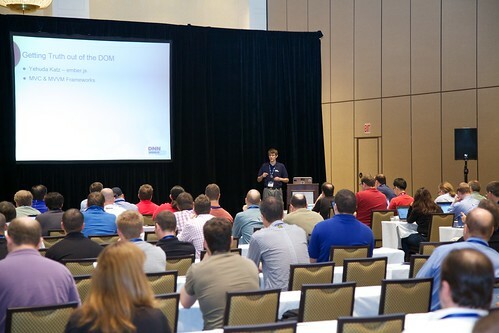 I just got back from presenting at DNN World 2012. It was a good time to see all of the folks in the DNN community who love DNN and are working to move it forward. DNN 7 is shaping up to be a wonderful major release with some well thought-out user experience changes, some great professional features, and developer productivity features, and the introduction of the forth-coming Nebula product is one to keep an eye on. In addition to presenting, I was able to walk away from the conference with a couple of awards. I was presented with one of ten DotNetNuke MVP awards for community contributions, which was very special. I've heard the sentiment from a few others, but it really is humbling and surprising to stand on the stage with folks whose work and dedication you respect. I don't see myself belonging with that group, but I'm pleased that the kind folks at DNN Corporation have a different view of it. I'm excited to see who joins the MVP ranks in the spring (they indicated that there will be MVPs names twice a year), as there are still quite a few folks who really deserve the title. So, in addition to that award, I was able to get up on the stage again (with the rest of the crew from Engage) to help accept the Site-of-the-Year award (non-profit category) for Visit Yellowstone. This site was a lot of work, and we're really proud of how it came together. It's great to be recognized for that work. 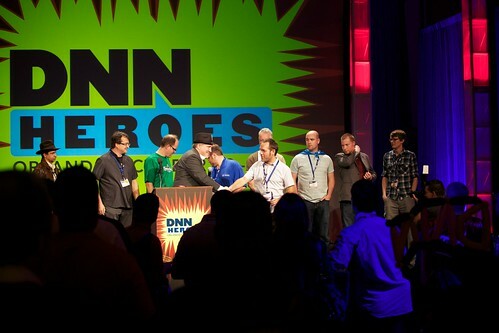 We were also really proud of Clint for winning the DNN SuperFan award (as well as being a fellow MVP). We were all rooting for him at the office; he is, without a doubt, the biggest, most active and genuine fan of DotNetNuke that I know. Overall, the conference was a really enjoyable and gratifying experience that we're looking forward to for next year.